So I bought a couple of leeks at the SF farmers market as big as my arm. (Much like the kale big as my head.) I loved the braised leeks with cod, and I still had some heavy cream left from that (minus a splash or two in my coffee  wicked rich). I also had some sliced ham in the freezer, left over from the holidays. 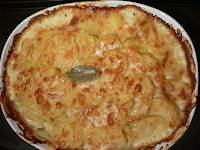 A nice gratin seemed just the ticket. 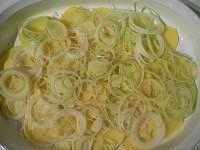 One really big, fat leek (you can use two or three smaller ones), trimmed and sliced very thin. You'll need to wash the slices thoroughly in a sieve if they're at all gritty, as leeks often are. Happily, these weren't. 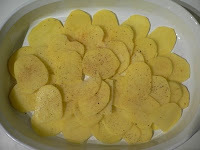 Two and half pounds of golden potatoes, peeled and sliced thin. A half-cup of chicken or vegetable stock or broth. Yes, I use canned. Sue me. 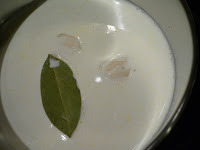 You put your liquids in a pan with the bay leaf and the garlic clove, bring it to a boil, then take it off the heat to steep while you prep everything else. Preheat your oven to 350. First a a third of the potatoes, then some salt, pepper and nutmeg. 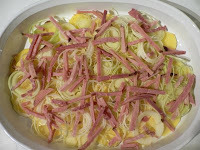 Then half the leeks and ham. 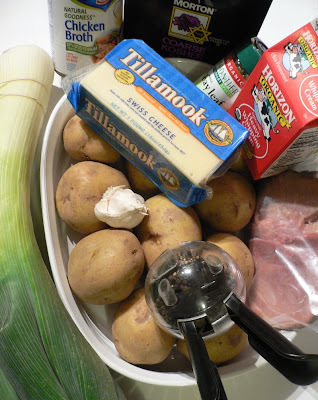 More potatoes, more spices, the rest of the leeks and ham and a final layer of potatoes. 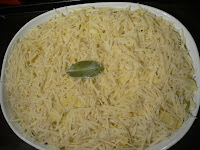 Pour the cream over it, discarding the garlic, sprinkle it with the cheese and bake loosely covered with foil for half an hour. Then take the foil off and bake for another 30 to 45 minutes. I basted it halfway through, just spooning some of the liquid from the sides to the top. I don't know that it was really necessary. Oh! I just looked out the window and it's snowing. Criminy. OK, this is a good hearty dish for a cold, snowy day! Sorry, the photos aren't so great. It was the middle of the night and I just wanted to eat and go to bed after spending many hours weeding and cleaning house. 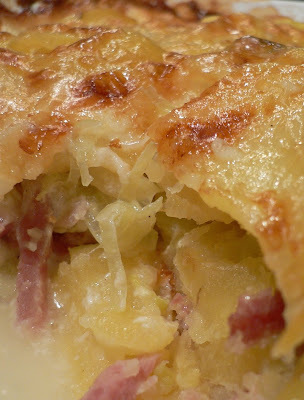 That looks so good with that golden brown cheese on top! AI have some ham in the freezer looking for a home as well. YUMMAH! I will try this. Yum wish someone would make that for me lol. Didn't they confiscate the killer leeks at the airport?? Snowing here, too, and 22 degrees predicted for tonight. I am so hoping it kills some more grasshoppers. I dug over the flower beds to expose more of those dreaded eggs, too. Not planting 100 heirloom seed packets for those critters to munch on! A little ham in the freezer is always handy, Kevin. I find it's a little spongy when it thaws out, but you don't notice that if you cut it up and bake it in a casserole. Amy, do. It's very easy, though all the peeling and slicing is time-consuming. Dani, here's to dead 'hoppers! No, they didn't take away my leeks, though when I opened the overhead bin a lot of heads swiveled at the onion smell that came wafting out.